It's difficult to know what to eat before, during and after exercise to naturally improve energy, stamina and recovery. Our three brand new recipes are ready in a flash and include some special ingredients to help you make the most of your workout. The athlete's favourite. Bananas are compact and full of nutrients while also being a good source of easily digestible carbohydrates, which are converted into energy by the body. It is also though the high levels of potassium in bananas may help you to avoid cramping during exercise. Somewhat an unsung hero, those in the know swear by honey as one of the best foods to eat pre-exercise. Natural and just as effective as an energy gel, honey is a simple carbohydrate made up mostly of unrefined sugars, which are easily absorbed by the body and prop up energy stores. 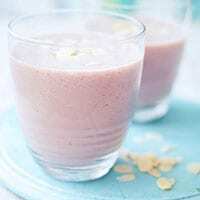 Almonds provide an energy boost in the form of natural, monounsaturated fats, giving your body another source of energy to draw upon when the going gets tough - particularly important for endurance exercise. Dried fruit is high in natural sugars and provides a concentrated dose of easily absorbed energy (carbohydrates) for the body. Pecans top up alternative energy stores, as they are high in natural fats. A good source of omega-3, which is thought to boost immunity and therefore optimises the body's energy levels. 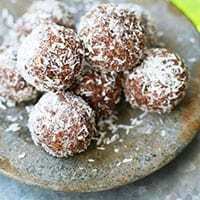 Just a tablespoon is needed in this recipe to ensure you don't get unwanted bloating as they are high in dietary fibre. 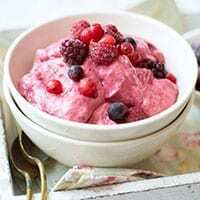 High in natural sugars, berries deliver much needed carbohydrates to muscles in the quickest time possible and can therefore help to replenish depleted energy stores after exercise. Protein is important for post-workout refuelling, as it is the nutrient that maintains and repairs muscles and lean body tissue. Depending on brand, Greek yogurt contains around double the protein of regular yogurt, so enjoy a hearty helping and heal those fatigued muscles fast.